Have you ever heard of a flippy disk? In the early days of computing when data was stored on larger, flexible 5.25″ floppy disks, a common practice of doubling the available storage space was to modify the disk by adding a second write notch (often with a hole puncher) so the disk could ‘flipped over’ and allow data to be written on the other side. 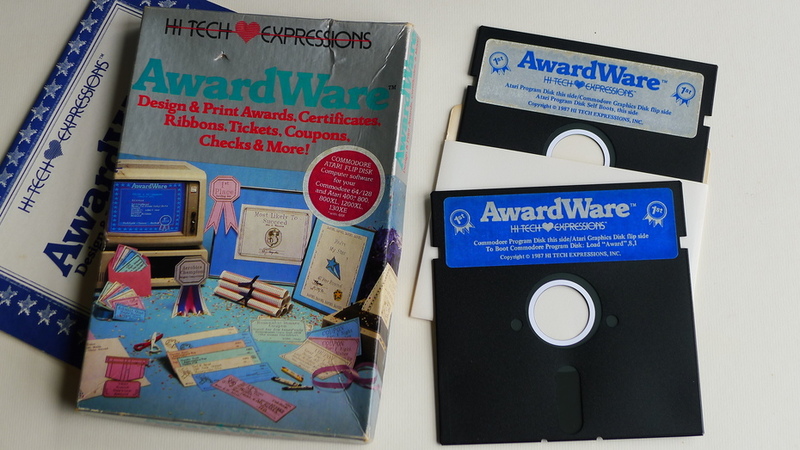 Here, we see two 5.25″ floppy diskettes for the program AwardWare for the Atari 800 and Commodore 64. Write protect holes are visible on both sides. When the hole is open, data may be written to the disk, but when covered, the disk is write-protected. This actually shortened the life of the diskette because it caused the magnetic disk inside the protective sleeve to spin in the opposite direction. Floppy disks also exposed the magnetic platter to the elements, and this allowed foreign substances to invade the diskette’s innards. Any dust or flecks trapped inside experienced two-way travel, affecting the diskette’s reliability. 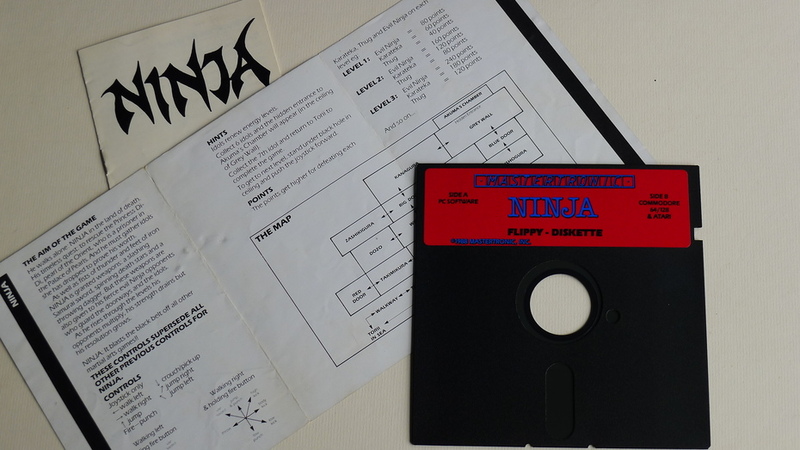 Some disks were even labeled Flippy Diskettes, such as the Ninja game seen here. Others, like JingleDisk, contained instructions on the label telling users to flip the disk over. For Ninja, side A (the label side) contains the PC version while side B contains the Commodore 64/Atari 800 version. Just flip the side that matches your computer. 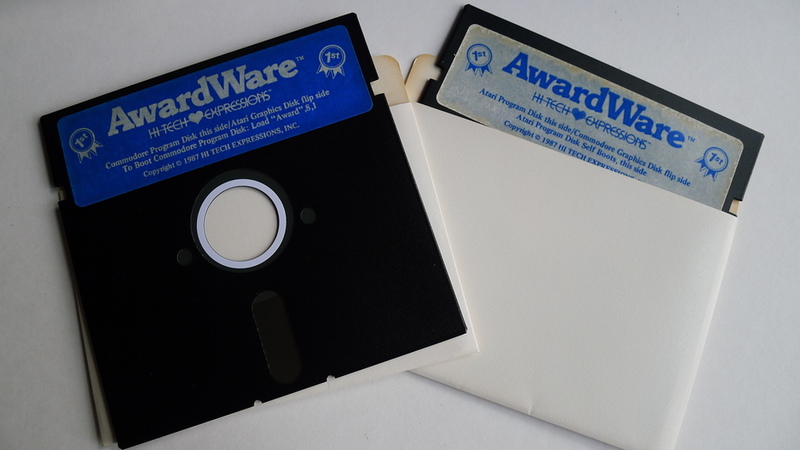 Software makers would do this to reach more consumers using the same disk since so many competing, non-compatible home computers were available at the time. 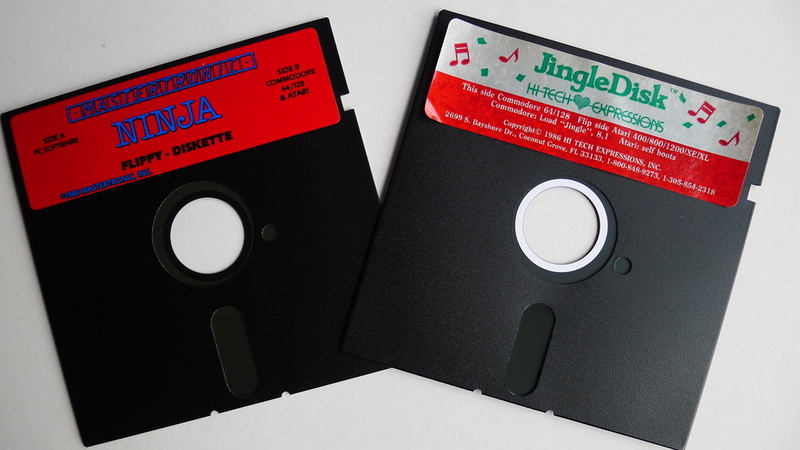 Ninja contains the same program for three different computer systems on one disk while JingleDisk supports two. Simply punch a hole in the other side of the disk and flip it over to use the other side! 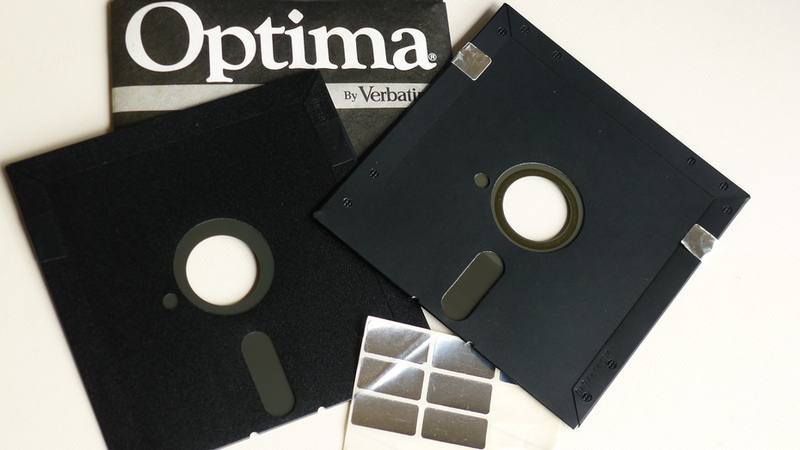 Floppy disks would often include write-protect stickers (the silver stickers) to cover the holes and write-protect the disk. Black electrical tape worked just as good. Games were so advanced back then that they included maps, hints, and illustrated controller descriptions to help players beat the game. This entry was posted on March 17, 2012, 3:33 PM and is filed under Trivia. You can follow any responses to this entry through RSS 2.0. You can leave a response, or trackback from your own site.